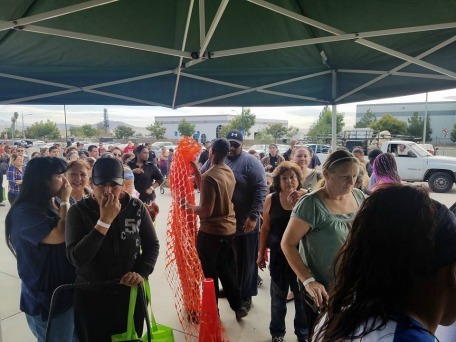 Young Visionaries Youth Leadership Academy held their annual Thanksgiving Food Giveaway last weekend to help needy families who may not have a Thanksgiving dinner. Young Visionaries led by CEO Terrance Stone worked with Community Action Partnership. City of Rialto, Rialto Middle School, Walmart and a whole host of community resources to put on this event Saturday. The event is more than just a food giveaway it is a full event with Vendor Booths, a mechanical bull and live music. During the holiday months, the need for emergency assistance to families tends to increase. It is with the community support through donations and volunteer time that we make possible 500 Holiday boxes of groceries to fight hunger during Thanksgiving. The Holiday Food Drive begins September 15 and runs through November 12. 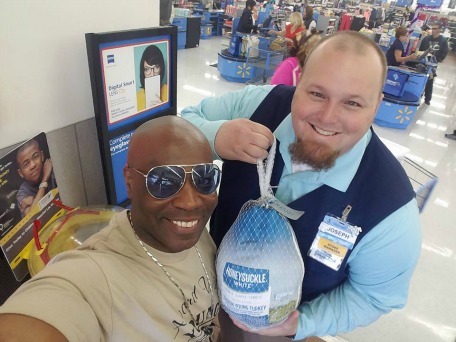 The donation of 500 turkeys by the Walmart in Fontana really helped make this day possible. CEO Terrance Stone did a Facebook Live Video that you can see here picking up the turkeys to give to the families in need. It is events like this that do two things. Remind those of us that have enough food to eat to be thankful for what we have and the need that still exists in the Inland Empire. A big thanks goes out to these awesome community partners that work hard to bring happiness to the live of those in need.